Today, the Baltimore Ravens announced that the team has reached an agreement with offensive lineman James Hurst. Hurst played all 16 games in 2017, 1 as an offensive tackle, 15 as an offensive guard. Hurst was given a four year deal, reportedly worth $17.5 million. $8 million of that contract is guaranteed. Hurst was drafted by the Baltimore Ravens in 2014, and had his best season playing wise, in 2017. 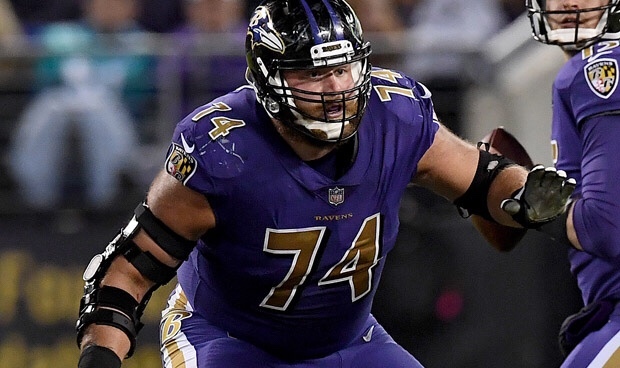 By giving Hurst a new deal, the Baltimore Ravens ensure one of the most versatile offensive linemen in the NFL remains in Charm City. The lucrative deal for a lineman who is seen as a plug and play rotational player, indicates that the Baltimore Ravens want to give him a bigger role in 2018. This is probably a prelude to more movements and maneuvers on the line. On the chopping block, next to be cut, is probably Austin Howard. By releasing Howard, the Ravens could free up $5 million in cap space, but create $2 million on dead cap. If the team does cut the veteran tackle, expect Alex Lewis to be moved to right tackle. Alex Lewis was set to start for the Ravens in 2017, but suffered a torn labrum in training camp. This move is the second re-signing the Ravens have made thus far in the offseason. Last week, the Baltimore Ravens gave defensive end Brent Urban a new, one year contract. Urban is coming off of a season ending injury he suffered against the Jaguars in 2017. It’s expected that there are plenty more moves to come this offseason for the Ravens. The team will likely target wide receivers and other needs, especially on the offensive side. Overall, signing James Hurst to a new contract is a great move by the Ravens. He provides the versatility and the ability to play almost anywhere on the line, abilities not possessed by many.